Knitting Relaxes Me: Who put that "kick me" sign on my car? It probably says "hit me," not "kick me." Remember this? Well, it happened again today, only worse. On my way to work, a woman turned left in front of me. 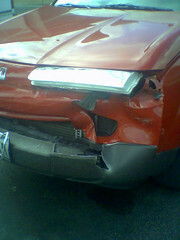 Her right front corner hit my left headlight area. Luckily, no one was hurt, but I was SO mad, which now makes me feel a little guilty, since she was definitely a little old lady/granny. I refused to move my car, or let her move hers, until the police got there so he could see that she had just turned in front of me. That shiny thing in the photo is the headlight assembly, not broken, but shoved up to a 90 degree angle from where it's supposed to be. So now my car is sitting at a shop, while we wait to find out if her insurance will pay for it, as they should. 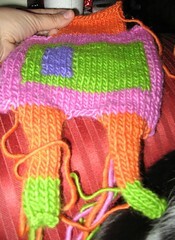 In spite of the intarsia squares, it's a fast knit. In addition to the front, I've done the back legs and started on the body. I'm hoping to finish the body tonight, which only leaves the little arms -- and seaming, stuffing, and applying eyes (after I buy them). It's a Christmas gift for a co-worker who saw the Jess Hutchison robots online and wants one SO bad. 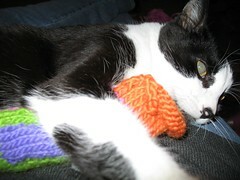 She knows I'm knitting it for her, and even helped choose the colors. I tried to get Simon to pose with the robot, but all he wanted to do was wrestle with it. Simon says, "I need one of these!"